ONE [David] Finlay shot at Belmoynock, by General Dalzel’s orders, because he could not discover who was in arms at Pentland, Anno 1666; James Davie in Bathgate parish, and several others at divers times, shot, as hearing sermons in the fields, before the insurrection at Bothwell-bridge [in 1679]. Colonel James Douglas, and Lieutenant Livingston with a party, surprized five men in a cave at Ingleston, in the Parish of Glencairn, to wit, John Gibson, Robert Grierson, Robert Mitchel, James Bennock and John Edgar, who were all brought out, and shot dead, without giving them time to pray; this was also Anno 1685. He likewise caused shoot John Hunter, for no other cause but running out from the house at Corehead. The same Colonel [James Douglas], Lieut. Livingston, and Coronet [>p40.] Dundasse, surprized and shot six men at prayer, at the Calduns, in the Parish of Minnigaff, viz. James Dun, Robert Dun, Andrew Mackliale, Thomas Stevenson, John Maclude and John Stevenson, in January 1685. He caused also take Adam Macquhan out of his bed, sick of a fever, carried him to Newtown of Galloway, and next day shot him dead. He caused also to be shot Thomas Richard, an old man of seventy years, as he was praying at Cumnock in Kyle. The said Col. [Douglas] together with the Laird of Lag, and Capt. 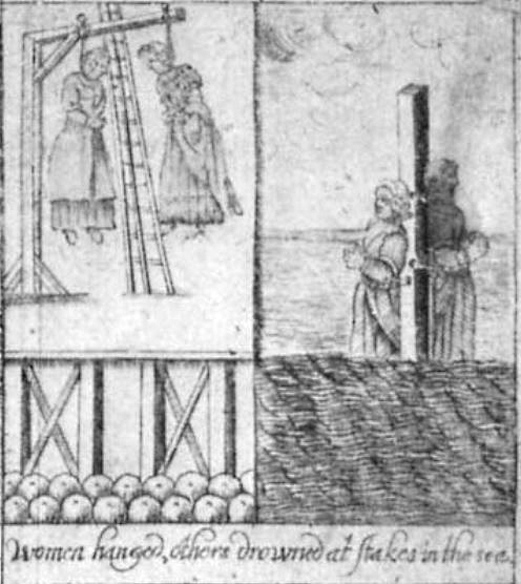 Winram, did illegally condemn, and inhumanly drown Margaret Lauchlan, upward of sixty years old, and Margaret Wilson about twenty, at Wigton, fastening them to stakes within the sea-mark; all this in 1685.
the said Captain and his men shot one Auchinleck a deaf man, for not answering them through defect of hearing, near Carlingwark, Anno 1685. Sir Robert Dalzel and Lieut. Straten, shot Daniel Mac Michel at Dalveen, in the Parish of Durisdeer in Nithsdale, Jan. 1685. The same men killed William Adam, hiding himself in a bush at the Walwood in Kyle, Feb. 1685. Bruce, Captain of Dragoons, took one James Kirke, carried him to Dumfriers, where he kept him prisoner one night, and next day brought him out and shot him without any further process; and the poor man desiring a little time to make his peace with God, this Episcopal missionary, the Captain, answered oftener than once, Devil a peace ye get more made up; correspondent to the worthy saying of the D. of Queensberry, one of the great patrons of the Prelatical clergy new, who answered one that came to beg a reprieve for some that were thus precipitantly condemned, that They should have no more time to prepare for Heaven, Hell was good enough for them. Craick of Steuarton hindered some gentlewomen that attempted to beg [>p.41.] his life; and Sir Robert Dalzel’s second son was one of them that shot him, and that without command; this was June 1685. This same Captain [Bruce] surprised and shot John Wallace, one Edgar, and another in the field, in the parish of Kirpatrick in Galloway, Feb. 1685. Coronet Dundasse, caused shoot John Semple, essaying to escape out of a window, in the parish of Delly, anno 1685. He also shot Edward Macken, without any trial, meerly because he had a flint about him, February 1685. 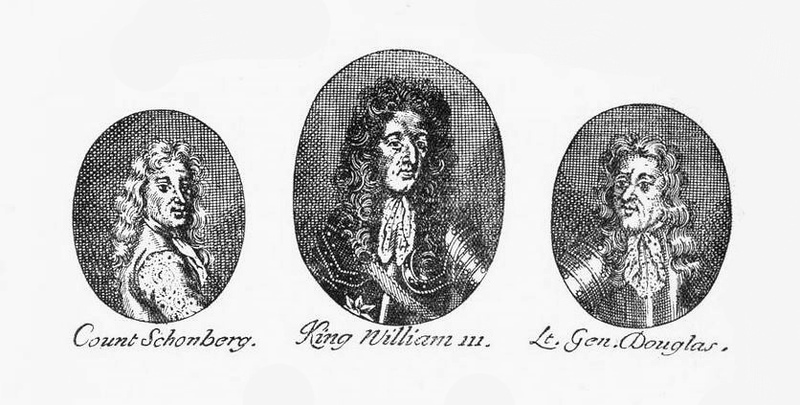 Lieutenant General [William] Drummond, commanded John Murchy and Daniel Mackilwreek, to be immediately shot, after they were taken near Camonel in Carrick, anno 1685; and at the same time his soldiers shot Alexander Lin. 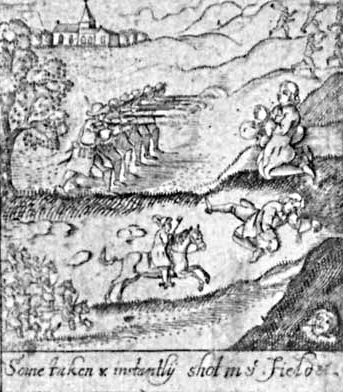 Captain Inglis, a profane ruffian, one of the first of the Episcopal missionaries, with his Dragoons, killed James Smith, at the Burn of Ann, in Kyle 1684. His son [Cornet Peter Inglis] killed one John Smith in Cunningham, in 1685; as also one James White, striking off his head with an ax, brought it to New-mills, and played at the football with it, anno 1685. He killed also one John Barrie, in Evandale, with his pass in his hand, April 1685. Major [John] Balfour, Captain [John] Maitland, and their party, shot Robert Tam, John Urie, and Thomas Cook, at Pomadee, near Glasgow, as about their work, May 1685. Col. [Thomas] Buchan, and the Laird of Lee, shot John Smith, in the parish of Lesmahago, February 1685. Lieutenant Nisbet and his party, shot to death John Ferguson, George Whiteburn, and Patrick Gemmil, in the parish of Fennick, in 1685. Lieutenant Murray, shot one John Brown, after quarters given at Blackwood in Clidsdale, March 1685. Lieutenant Crichton did the like to David Steel, in the parish of Lesmahago, December 1686. The Laird of Steenhouse, Sir Robert Laurie of Maxweltown, and Craick of Stewarton, [>p.42.] urged Coronet [John] Baily’s party of Dragoons, to shoot William Smith of Hill, and refused to let him be buried in the Church-yard. 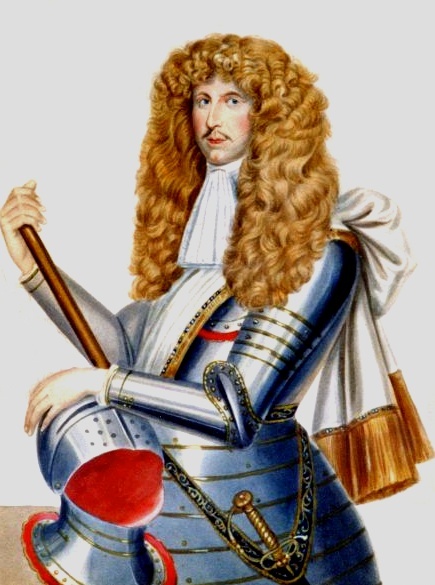 Sir James Johnston of Westerhall, urged Claverhouse’ troops to shoot Andrew Hislop, in so much that Claverhouse said, His blood should be on Sir James’s head, May, 1685. Sir Robert Griersn of Lag, with part of Claverhouse’s and Strachan’s men, surprised John Bell of Whiteside, David Haliday of Mayfield, Andrew Maccrabeit, James Crabeit, James Clement, and Robert Lennox of Irlinton, and barbarously killed them after quarters, without allowing them time to pray; which when John Bell of Whiteside begged, Sir Robert answered, What devil have you been doing, have you not prayed enugh these many years in the hills? and so shot him presently in the parish of Tongland in Galloway, February 1685. The said Laird of Lag did also hang Alexander Melluby, and John Gordon, at the Miltown of Air, without any trial, and caused them afterward to be hung on a tree, at the kirk of Iron Gray, where he left them hanging. He also pursued another, David Haliday, and George Short, apprehended and shot them in the night, in the parish of Wynhame, in Galloway, anno 1685. The laird of Culyan, with a troop of horse, killed William Mckergour, at Blairquhan-mill, anno 1685; and Gilbert Macadam, in the parish of Kirkmichael, July 1685. 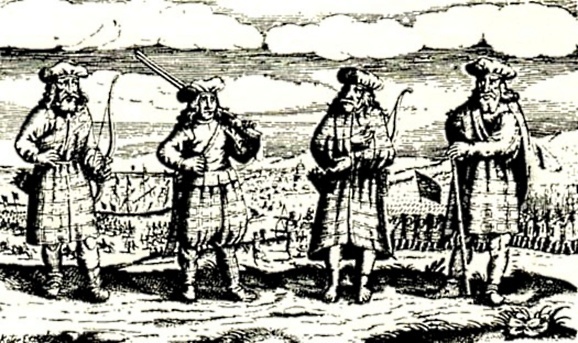 A party of Highlanders killed Joseph Wilson, David Dun, Simeon Paterson, and two more [John Jamieson and John Umphrey], near the water of Kill, anno 1685.
and a little after William Paterson was shot at Strevin, and John Maclorgan shot at Drummellian’s house in the night, not known by whom. And in June 1688, John Reid shot George Wood, a boy of sixteen years old, without asking one question at him. ~ by drmarkjardine on September 11, 2015.